Sunah Hwang says she can’t afford to go back to work because child care for her two children would be too expensive. NEW YORK (CNNMoney) — After factoring in the rising cost of child care, the daily commute and other work-related expenses, a growing number of mothers are figuring out that having a job just doesn’t pay. It comes down to a cost analysis and I have several clients that have taken the route of quitting, said Anna Behnam, a financial advisor at Ameriprise Financial in Rockville, Md. Factor in taxes, transportation costs, clothing and lunch — what is the true net that you bring home after salary? Over the past few years, the debate over which lifestyle is more financially feasible — working and paying for child care versus staying at home — has come up more often among Behnam’s clients than ever before. For most working parents, child care is by far the greatest expense. In 2010, the cost of putting two children in child care exceeded median annual rent payments in every state, according to a report by Child Care Aware of America. The recent run up in gas prices has only drained paychecks further, shaving 8.7% off of the average worker’s annual income, according to the Oil Price Information Service. And then there are the rest of the expenses that add up for workers, including clothing and dining out during the day, which are also on the rise. Andrea Hayken, 34, made about $45,000 a year as a third grade teacher in the Fairfax, Va. county public school system. But licensed daycare for her now four-year-old son would have cost $2,000 a month, eating up nearly half of her before-tax income. Since her husband, an attorney, earned more money than she did, it made more sense for Hayken to be the one to stay home. When all was said and done, there just wasn’t enough money to make [working] worth it, she said. It’s a complex decision where you are weighing all sorts of factors, said Ellen Galinsky, president and co-founder of non-profit Families and Work Institute. It’s your current costs and your future earnings and your desire to be at home, in combination with the desire for your children to have early educational experiences. In the end, many lower- and middle-class mothers just don’t make enough money to afford to work, she said. Even though women surpass men in educational attainment, they earn an average income of $35,776 a year, about 20% less than their male counterparts, according to the Labor Department. Women are also nearly twice as likely as men to work part-time and work in the lower-paying public sector, the Department of Labor said, which is also where a disproportionate number of jobs were lost over the last four years. Sunah Hwang, 38, never intended to leave her job as a public school teacher after her son was born in 2007. I always wanted to be a teacher. I thought I could spend time with my kids and have the best of both worlds, she said. But the family’s finances told a different story. Hwang made $48,000 a year but brought home about $30,000 after taxes, health insurance and retirement contributions. Even though the Hwangs live in Virginia, where child care costs are among the lowest in the country, care for one child still would have cost $12,000 a year. It wasn’t worth $18,000 for us to let somebody else raise our son, she said. So Hwang quit her job. Now the family relies solely on her husband’s annual income as an IT consultant, which has not quite been enough. 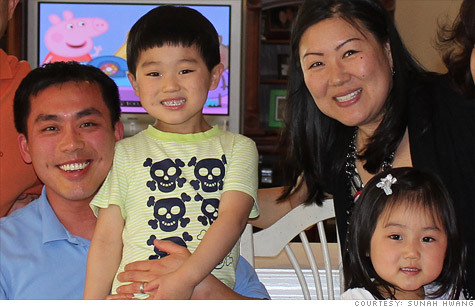 When Hwang was pregnant with their second child, her husband picked up a part-time job as a real estate broker on weekends, but money is still tight. We’re not struggling, we’re surviving, but we are not living well off, she said. In order to make ends meet and still put money away for retirement and college, the Hwangs have cut out luxuries like family vacations and summer camp for the kids. Still, if she goes back to work it could cause further strain. I want to go back but it’s not feasible. Now that we have two children there’s no going back to work because it is too expensive. An earlier version of this story quoted Hwang as saying we are not living well at all instead of we are not living well off.